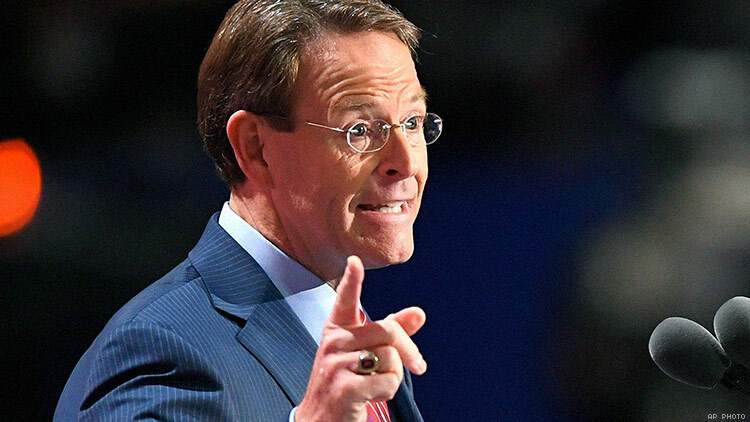 Leaders of the religious right are willing to forgive Donald Trump’s personal failings, including his alleged affair with an adult-film star, as long as he supports them on policy, Family Research Council president Tony Perkins said in a new podcast. “We kind of gave him—‘All right, you get a mulligan. You get a do-over here,’” Perkins said in the most recent episode of Politico’s Off Message podcast. Trump’s actions in office include many anti-LGBT moves, such as his revocation of guidelines on how schools should accommodate transgender students (who often are truly bullied) and his attempt to reinstate the ban on transgender people in the military (currently blocked by courts while lawsuits proceed). There are also the “religious freedom” guidelines from his Justice Department, which allow government employees and contractors to turn away LGBT people and others who offend their religious sensibilities, and a new action to approve such discrimination by health care providers. On abortion and contraception, Trump has reinstated a policy keeping U.S. funding from family planning organizations that so much as discuss abortion with overseas clients, rolled back the Affordable Care Act mandate for employers to cover contraception without co-pay in their group insurance plans (also blocked by courts), and allowed states to cut Medicaid funding for Planned Parenthood. Perkins also said Trump has grown in his faith, and his only complaint about the administration regards Secretary of State Rex Tillerson, who Perkins said is not doing enough to stop the creation of “pro-abortion, pro-communist groups” overseas.